If we were to sit on our laurels and believe we knew it all, we would never be able to offer the hairdressing experience we do now. Hairdressing is a trade where once you become qualified, you are free to hairdress for the rest of your career without being asked to train again. In fact, there is no law to say you have to be qualified to be a hairdresser at all to work in hairdressing (which may account to any bad experiences you may have had!). We believe that hairdressing is an ever evolving skill and we pride ourselves on our training and education. Education is a vital element for all our stylists and we are constantly training and enhancing our hair knowledge and expertise so that we can offer our clients the latest technology and techniques. As a proud Wella salon, we utilise every education opportunity offered to us by Wella andour team are constantly back and forth to the prestigious Wella World Studio in London, who provide the best in hairdressing education. 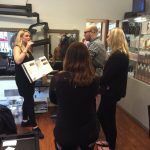 The courses they provide teach the latest trends and techniques and give our stylists the opportunity to participate in practical workshops as well as theory based learning, which enhances their knowledge, ability and experience. 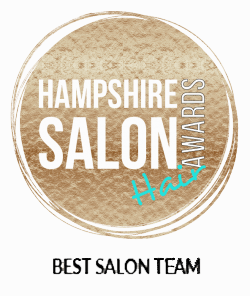 The studio itself is a hive of creative activity providing our stylists with an inspiring artistic environment which is hugely motivating and they always come back to the salon with a buzz of excitement and eagerness to relay what they have learned. 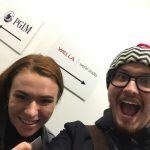 Every member of the team who attends a course at Wella World Studios brings a little bit of London back with them and a lot of passion and knowledge to add to their portfolios. 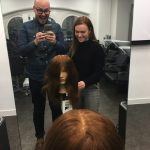 Wella provide an amazing education programme and as well as training in London, we also have our own personal Wella Trainer who comes to the salon every few months for in house training. During these sessions, Sasha from Wella dedicates the day to teaching us new colouring styles and trends which keeps us at the forefront of hair fashion and new trends which we can utilise in the salon the very next day! 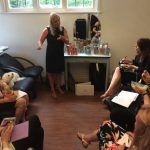 These sessions provided by Sasha give our stylists so much knowledge and she is always so encouraging and passionate about hair and always inspires us to be creative with our clients. We have so much fun in the sessions as Sasha really fits in well with the team and makes the most of the time we get to spend with her so she really feels like one of us! 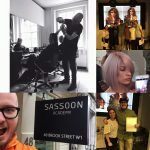 ‘In hairdressing it is really important to do on-going training to keep up to date with new trends, techniques and products. Within William & Mary we use a variety of different products, home care and colouring products to create beautiful results. 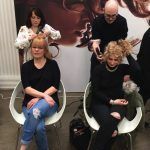 Sebastian have created a new product line called “Twisted” so Mary and Emma were quick to get a trainer to come down to the salon to have a session with the team. Gents hair is just as important to us as ladies hair and we are so pleased that Callum is able to teach us what he has learned during his time with Mike Taylor who has won numerous awards and his education is much sought after within the hairdressing trade. Callum intends to extend his knowledge and continue his learning with Mike in 2018 and we may even bring the wet shave experience to Ashley Heath. Fancy that!!!! Education is such a vital part of hairdressing and life in general. If we don’t continue to grow we stay where we are and life and hair is a growing entity which we choose to embrace at William and Mary so here are some photos which capture the spirit of this growth.